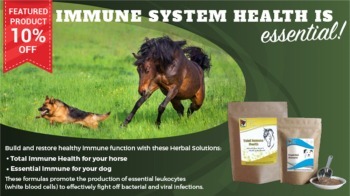 One of the extra benefits with these herbs is that the horses love them. All you have to do is squirt a little on their tongues so they know this will be a treat and watch them come back for more. Gently shake the container before each use to mix any settled herbs. Use the equipment provided in the plastic bag so your measurements will be accurate. Measure the recommended number of scoops of herbs into the cup. Add warm tap water up to the 1-1/2 oz. line. Tighten the cap and shake to mix the herbs and water thoroughly. If water and herbs separate just re-shake syringe. Place the closed syringe into the cup and pull the plunger up to draw the solution into the syringe. 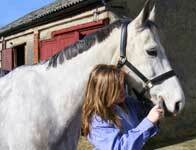 Gently insert the tip of the syringe in the corner of your horse’s mouth. 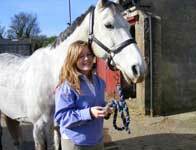 Squirt the solution at a slow enough rate for your horse to swallow easily. Please do not shove the solution in quickly. Just give your horse the time to discover that these herbs are a treat. Soon it will become a delightful part of the routine for both of you – a healing solution you can both enjoy. 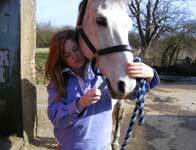 Relax with this – your horse will love you for it. Tip for keeping your syringes in good working order – Rub a small amount of vegetable oil on the rubber tip when it is dry. 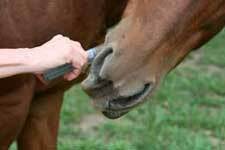 If you are not using a syringe: Just top dress a small amount of food (about a ¼ cup) with the herbal solution or place it in a bucket to allow your horse to lick it up directly. 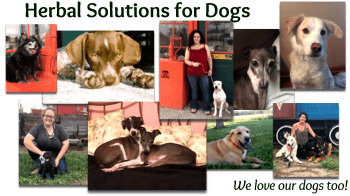 If using more than one of our Herbal Solutions, mix and administer each solution separately. Herbs should not be given within two hours before or after medication. For quicker results, increase dosage by 2 scoops. Recommended dosage: Give the following dosage twice daily. 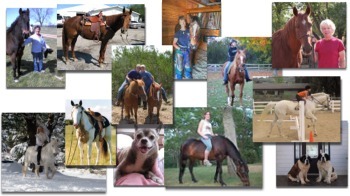 For a specific dosage program for your horse's unique situation, email contactus@forloveofthehorse.com or call customer service (866) 537-7336. Giving Bonnie her herbal solutions!